The 26th China International Exhibition on Packaging Machinery&Materials concluded successfully! Guangdong Kenwei Intellectualized Machinery Co.,Ltd, invited to participate in The 26th China International Exhibition on Packaging Machinery&Materials,in order to show the information solutions tailored for the weighing and packaging machinery industry, the existing partnership has been consolidated and huge business opportunities have been found. During the three-day exhibition ( 04. - 06. 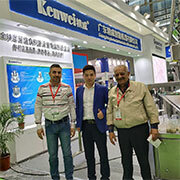 March 2019),Kenwei exhibition has attracted many exhibitors. Our staff always communicate with our guests with great enthusiasm and patience. Under the brilliant speeches and exhibitions of Kenwei employees, the characteristics and advantages of Kenwei products have been vividly demonstrated. Customers and exhibitors have a certain understanding of the products, and show strong cooperation intentions. In the weighing packaging industry of the future, Kenwei always adheres to the enterprise concept of "help customers to improve competitive power and profitable ability by providing quality machines,best service and faster innovation". Company: Guangdong Kenwei Intellectualized Machinery Co.,LTD.